And that is completely true! Bees, like we do, need some water during the day and with all the busy bees taking care of us it is very important to create a water resource or ‘bee bath’ for them. What do bees need water for? “To dilute honey – bees use water to manage the consistency of honey and thin out honey that has crystallized. To help with digestion – just like us, bees need water to aid in their digestion. To keep the hive cool – these smart little creatures will add water to the hive and fan it with their wings, air-conditioning the space by cooling it down. So how to make a bee bath? 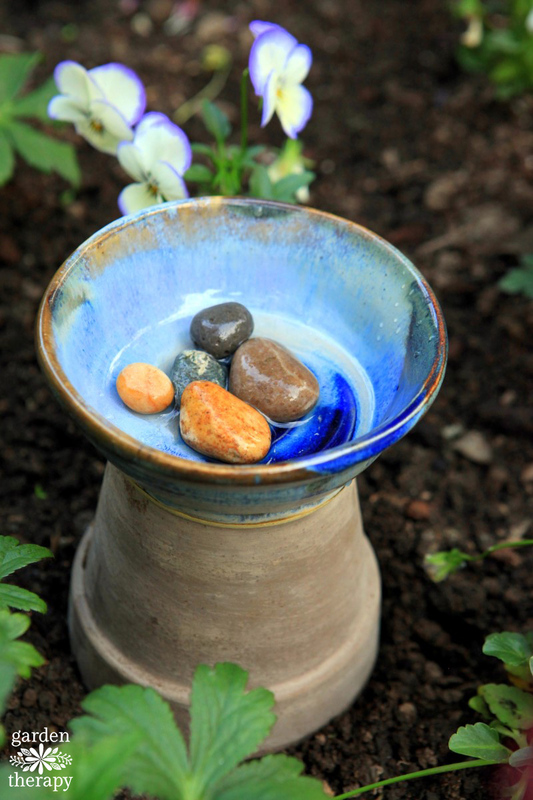 Garden Therapy explains it very well for us: You need a shallow dish (that is water safe like glass or ceramic, as plastics and metals may leech into the water), a plant pot, river stones and fresh water. Choose a spot in the garden where it is protected and shady. Set a plant pot upside down and put the shallow dish on top of the pot. Add a few river stones and just enough water that the top of the stones are not under water. Change water daily and clean the bee bath weekly. For the complete story about bee baths, check the website below! They help us out by giving us food, we can help them out by giving them water!